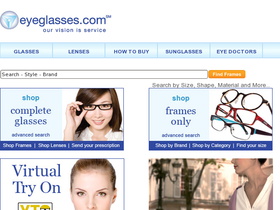 Visit Eyeglasses online at Eyeglasses.com for the best service, selection, and prices on glasses and lenses. Eyeglasses makes it easy to direct order glasses from your computer: search for glasses by model, brand, size, style or many other characteristics with Eyeglasses advanced frame search function. Eyeglasses.com carries Gucci glasses, Armani glasses, Ralph Lauren glasses, Ray-Ban sunglasses, Prada glasses, Marc Hunter and over 500 other brands of eyewear frames. Save on your next purchase from Eyeglasses.com with Eyeglasses discounts, Eyeglasses coupons, Eyeglasses promotions and Eyeglasses savings from 58coupons.com. Get 8% off any order at Eyeglasses.com with this coupon code. Click to save. Eyeglasses.com is offering free 1-day shipping on orders over $55. Click link to view. Eyeglasses.com has popular designer glasses starting as low as $40. Check them out by clicking the link. Eyeglasses.com has reading glasses starting as low as $49. Click on link to view. On orders over $55 Eyeglasses.com is offering next day UPS delivery for only $5.95. Click link to order your glasses. Ray Ban Sunglasses Starting at $99. Eyeglasses.com has current style Ray Ban Sunglasses for as low as $99. Click link to start shopping now. Feel secure when ordering from eyeglasses.com, they have a great refund policy. Check it out by clicking the link.